Versatile system combines full-flow and by-pass oil filtration on a single, easy-to-install mount. (Dual mount only, does not include hose or fittings). Full-flow filtration on a single, easy-to-install mount. 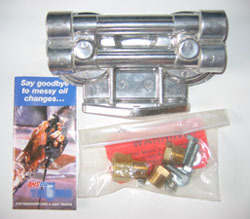 Includes mount, hose and fittings. Combines Full-Flow and By-Pass filtration on a single, easy-to-install mount. All installation parts except filter spin-on adapter are included. 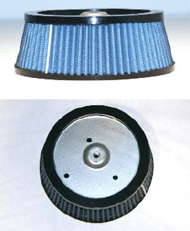 Must purchase the spin on adapter that matches the filter thread on your vehicle. Without filter elements - 2 required. For use with EaBP90, EaBP100 or EaBP110 Element. The Ea By-Pass Oil Filter (EaBP) provides the best possible filtration protection against wear and oil degradation. 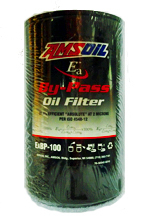 Working in conjunction with the engine�s full-flow oil filter, the AMSOIL Ea By-Pass Filter operates by filtering oil on a �partial-flow� basis. AMSOIL SDF Filters contain a combination of cellulose, synthetic and glass blend media to provide longer life and improved efficiency. 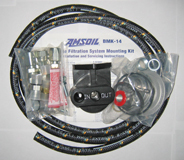 An oil pressure relief valve assures proper oil flow at all times under all operating conditions. Each heavy-duty case has a drawn steel double-crimp at the base with a rolled-under seaming. 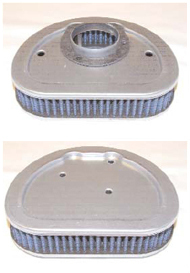 A proprietary elastomer anti-drain back valve keeps dirty oil in the filter when engine is not running. 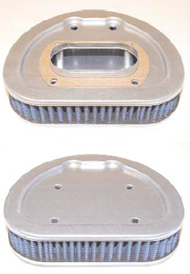 Performance tests demonstrated that AMSOIL SDF Filters provide over 75 percent better combined efficiency/capacity than other popular filters. 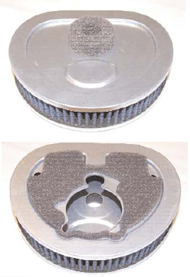 A full-flow filter specifically designed for extended drain intervals and severe service for motorcycle and ATV applications. 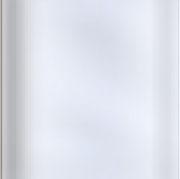 It provides superior efficiency and greater capacity than other popular filters. 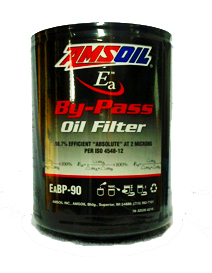 AMSOIL Ea Motorcycle Oil Filters are made with premium-grade full synthetic media. Ea Motorcycle Oil Filters feature advanced full synthetic nanofiber technology, making them the highest efficiency filters available for the motorcycle market. Use PART NUMBER drop down to select filter. New AMSOIL High Tack Foam Filter Oil is a special blend of synthetic polymers that allows maximum air flow and increased particle removing efficiency and capacity. 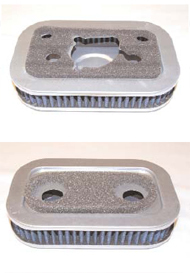 High Tack Foam Filter Oil stays in place throughout service life, resists washout from carburetor fogging and will not plug foam filter cells, while its new red color helps ensure even oil coverage across the entire filter. This site uses 128-bit secure encryption to create a safe online shopping environment.